Founded 10 years ago by the 2 current owners, who between them have a combined experience of more than 40 years of brand name distribution and product support, the business was established originally to distribute and provide product support for construction machinery. A move to a purpose built site in Peldon lead to a natural progression into the agricultural market and has seen the company being appointed as distributors for Valtra tractors along with other quality brands such as Vogel and Noot, Suzuki and Vapormatic to name a few, covering Essex and South Suffolk. 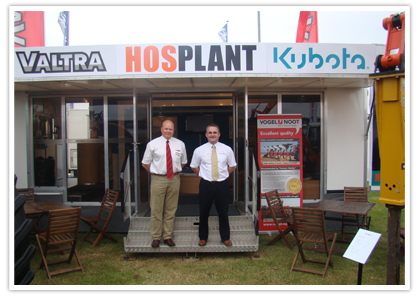 In 2011 we were pleased to be appointed Kubota mini and midi excavator dealers for the territory of Essex, Suffolk and Norfolk. Above all we offer value for money combined with first class customer service and a comprehensive parts back up.